I recently read a blog article entitled "Five Secrets of Great Leaders Who Get the Most Out of Meetings" that I found to be helpful. It had the basic, essential information that everyone who runs meetings should follow, but I thought it might be especially timely as most of our chapter boards are transitioning.Through my SDA journey, I have been a part of many committee meetings and these tips are essential to committee chairs and board leaders. Obtaining the skillset necessary to run an effective meeting is a big part of learning to lead. Here are five key ways the article said that a skilled leader gets the most out of meetings. Everyone knows that a meeting without a clearly defined and communicated purpose is a recipe for ineffectiveness. Successful leaders will go beyond merely providing a purpose statement. They will arrive at a meeting knowing what they need to get out of it and they will be prepared to steer the meeting in the right direction should the conversation go off-topic. A creative approach that can be useful in meetings is to map out the agenda using a visual diagram, such as a mind map, and use it to document discussion points, decisions, and action items during the meeting. A good leader makes sure everyone speaks the same language. In a meeting, it can be easy to misunderstand what others are saying. It's also easy to be misunderstood. When speaking in front of people - and, in some cases, on the spot - there is a risk that messages may come across in a skewed or less than clear way. A great leader recognizes this risk and takes steps to ensure that everyone is speaking the same language. This could include developing an annotated agenda that includes key messages, coming to the meeting prepared with speaking points, and taking the time to speak slowly and asking others to clarify any positions that seem vague. This is just as important for a small team meeting as it is for a large board meeting. A good leader is patient and encourages everyone to engage in a conversation. Imagine the worst meeting you've been to. Did the chair point fingers, assign blame, or - worst of all - resort to threats? This is no way to run a meeting, nor is it an acceptable way to treat staff. Conversely, a good leader will run a meeting in a way that fosters respect, empathy, and professionalism. Productive meetings focus on strategy, information, and decision-making. A way to ensure this is to never go into a meeting blind. Know what the problems are before the meeting starts, so you can react in a calm and professional manner. A good leader doesn't treat differences as weaknesses. Make the most of a meeting, it's important to consistently and repeatedly focus on results and not on egos. If you demonstrate to others, through consistent actions, that you will value and respect different opinions, you will build trust and encourage meaningful dialogue. You never know from where, or from whom, the next great idea will come! A good leader buys the first round. In fostering professionalism, there can be a tendency to become distant, disconnected, and impersonal. A good leader knows how to maintain professionalism, while building meaningful relations with staff. Don't be afraid to get to know your people personally. After a tough meeting, find other ways to relax and build camaraderie. Get to know them, and let them know you, too. Meetings hold great potential. By treating each meeting as an opportunity, you can create a culture where meetings are respected and productive, and seen as a positive part of the business day. Take lessons from great leaders, and don't settle for mediocre meetings. What tips would you add to make this list even more complete? Share your thoughts in the comment section below. Monica Hodges, CDFA is the SDA National Past President for the 2017-2018 term. Leadership. An intimidating word! 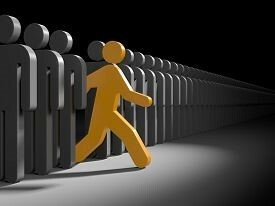 You’ve been hearing your whole life that you should be a leader, not a follower. But what does being a leader really mean? Leaders inspire others. They can identify a problem before it gets out of control. They find a way to connect with others and take them where they need to be. They are the decision makers. They show their leadership through results, not talk. And they know how to achieve goals. A really great leader motivates people to do things they didn’t even know they wanted to do and leaves them with a feeling of personal accomplishment. They let others shine. In this world where we are too often more interested in taking the credit then accomplishing the goal, it is difficult to be a good leader. It’s hard to put the objective ahead of ourselves and let others get the praise. But if it was easy, everyone would do it. John F. Kennedy once said, “Leadership and learning are indispensable to each other.” SDA embodies this sentiment by providing an opportunity for both to all members. Who has inspired you? What leadership role are you motivated to try next?